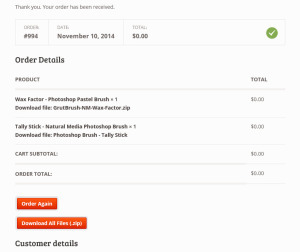 Now when you add 4 brushes to your cart from the shop you can get another 1 for free! That works out to $3 for 4 brushes. The deal is cummulative, so if you buy 6 you can get 8 brushes or put more simply, every fourth brush is free. Just keep adding and the cart will add the discount automatically. The best deal is still the All Brushes package which will give give you every brush in the shop, plus any new brushes published in the next 30 days for only $10. 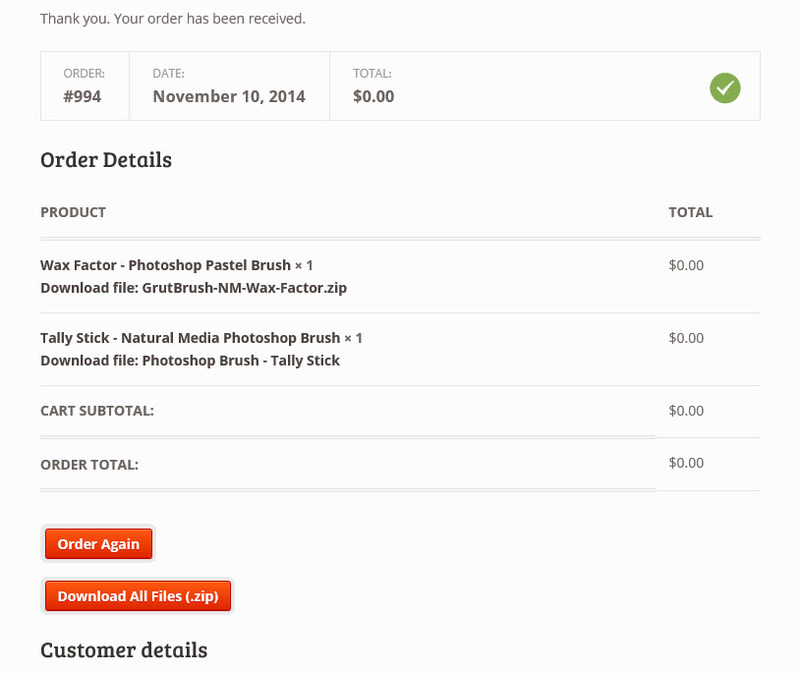 Currently that works out to 42 44 brushes for $10, or 22 cents per brush! 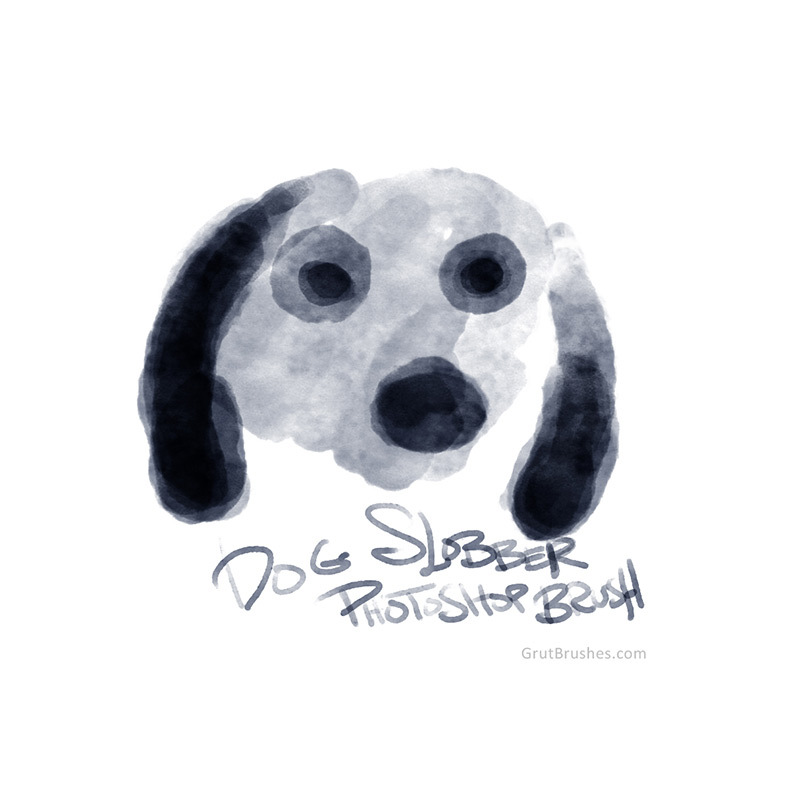 My latest Photoshop watercolour brush “dog Slobber” is available in the store now. It’s free for a short while, so grab it now before it’s gone. It’s a nice subtle fill brush with a lot of variability. A cousin brush to Pond Meander, this sketching ink brush Inter Mittens also has intermittent lines but it has a much softer appearance and a round muted stroke edge for a softer soggier look. I’m giving away 20 free Inter Mittend brushes with the coupon code freemittens (Coupon still valid until button has ‘expired’ tag) click below to download the brush for free. 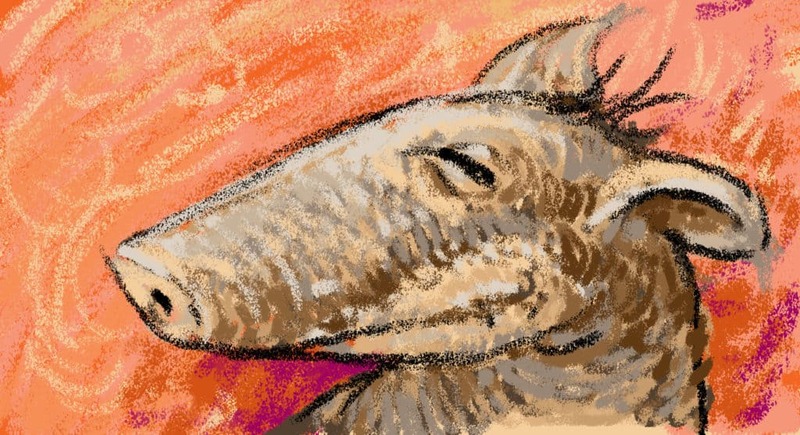 This latest Photoshop Ink brush “Pond Meander” has a scratchy broken line and appears to bleed into the paper. I like it quite a bit for sketching as it’s “predictably undpredictable” in that while no two lines are identical, it has quite a consistent look which makes it good for drawing as you know you can make identifiable outlines which still have a nice organic messiness to them. I will post an example drawing here and on the brush’s page soon. I’m giving away 20 free Pond Meander brushes with the coupon code pondfree (Coupon valid unless button has ‘expired’ tag) click below to download the brush for free. 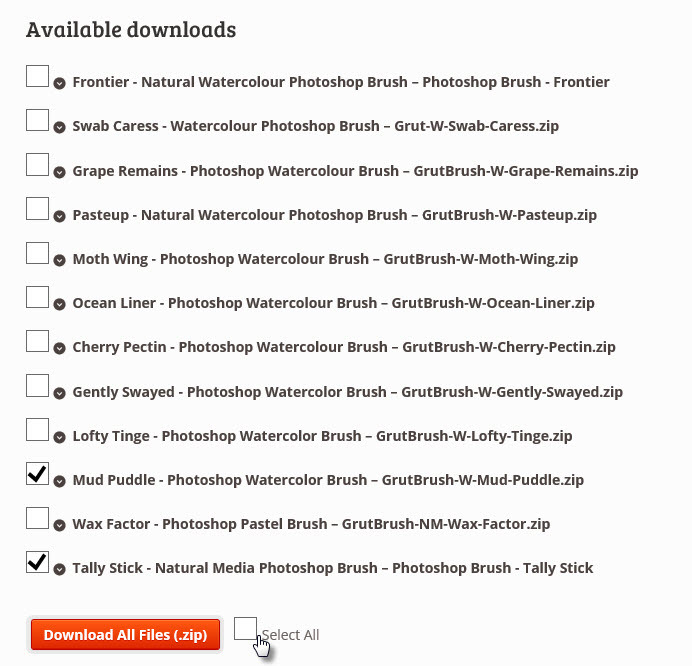 If you have purchased a lot of brushes you know that your downloads list on your account page can get quite long and downloading all of them could be a bit time consuming if not tedious. Now you can download all your purchased brushes (new and archived) in one go! 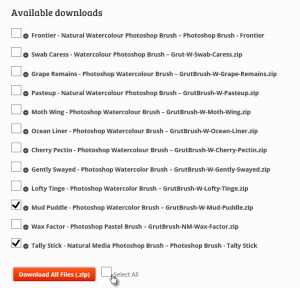 Just select all the brushes you want to download and click on the “download all files” button and you can download all your brushes at once in one zip file.